I’m sure that on many occasion you’ve been traveling around Batam with your tummy grumbling looking for a place to eat. One of your options is a warung lesehan. 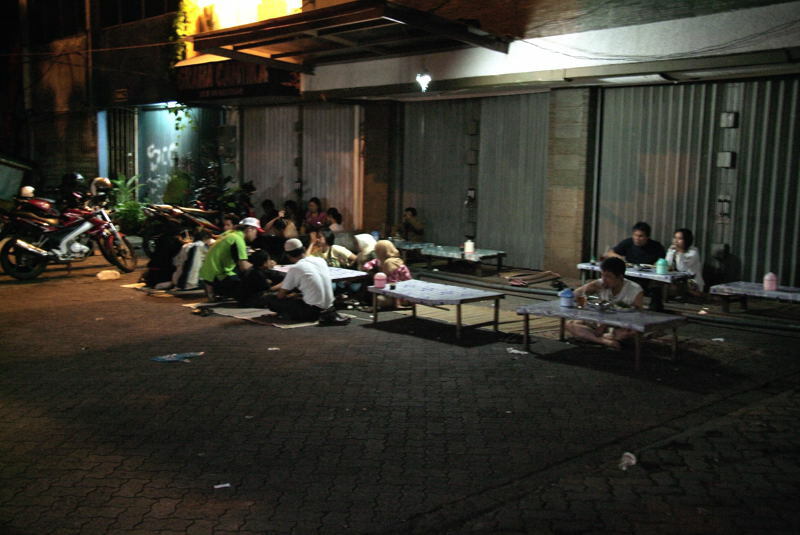 A warung is a place that sells commodities such as food, drink or other things ranging from medicine to telecommunications; whilst lesehan means sitting on the floor on mats. It’s just like if you go to a Japanese restaurant. Lesehan-style warungs are not exclusive to Batam; in fact, you can find them all over Indonesia. The most common food sold at this type of warung is salt-water or fresh water fish and fried or grilled chicken. Most warung lesehan also provide the option of common Chinese-Indonesian dishes such as fried rice (nasi goreng), fried noodles (mie goreng) or stir-fried vegetables (cap cay ). Many late-nite warung lesehan cook their food at the front for all to see. It’s fascinating watching how practiced and skillful they are. At this stage, don’t forget to specify just how much chili (sambal) want on your grilled fish because the locals love their food hot and spicy. Most people like to eat fish or chicken with their hands, cleaning them first with the bowls of lemon-scented water provided (they are not for drinking!). There are, however, knives, forks and spoons provided. All over Batam you can find good warung lesehan which serve tasty, inexpensive food. If you try one of the ones in Batam at night it is highly likely you will be accompanied by guitar-wielding buskers – if you feel inclined, you can give them a thousand rupiah for these efforts. Eating at warung lesehan is easy on your pocket and is lively, local fun. Give them a try! Previous articleTeh obeng what is that?